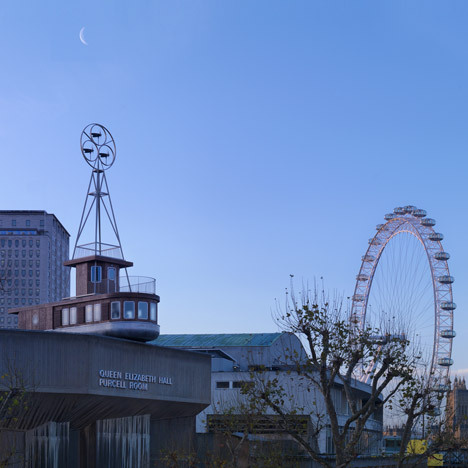 A boat-like structure temporarily anchored to the roof of London’s Southbank Centre is in fact a rentable one-bedroom apartment by London architect David Kohn and artist Fiona Banner. Completed following a design competition instigated by Living Architecture and arts organisation Artangel, A Room for London will remain atop the Queen Elizabeth Hall until the end of the year. The apartment was modelled on a riverboat that travelled to the Congo in the nineteenth century and features a pyramidal steel mast. Magenta and turquoise-stained wood lines the interior, where bespoke furniture includes a bed that slides on rails and a combined sofa and bookshelf. A pull-down ladder leads up to a first-floor library, which contains a logbook where guests can note any observations from their stay. Living Architecture have commissioned a series of holiday homes from renowned architects - you can see more of their projects here, including the early designs for this project. Photography is by Charles Hosea. Sell out architectural installation on South Bank opens January 2012. ￼￼￼￼￼￼￼￼￼￼￼￼￼￼￼￼￼￼￼￼￼￼￼￼￼￼￼A Room for London is a one-bedroom installation available to rent throughout 2012, and a programme of extraordinary events. The initial bookings for a night in this remarkable architectural space sold out within minutes when they went live in September. The second tranche of bookings (for nights July – Dec 2012) go on sale on 19 January 2012. A Room for London is a major collaboration between Living Architecture and Artangel, in association with Southbank Centre. Designed by David Kohn Architects in collaboration with Fiona Banner, it was the winning entry in an open competition to create a room on one of the most visible sites in the British capital, where up to two people at a time could spend a unique night in an exemplary architectural landmark. They set out to create a visitor experience of dramatic contrast between public and private space: the familiar and domestic are all here, contained within this intimate structure, perched on one of London’s most public vantage points. Despite this, the visitors’ privacy is completely protected and it is they who are able to look out at London and the people below. A Room for London thus becomes an urban landmark for 2012. Kohn and Banner’s design shows contemporary architecture at its most playful and thought-provoking. The structure is inspired by the riverboat captained by Joseph Conrad whilst in the Congo in 1890, a journey echoed in his most well-known work Heart of Darkness. The pyramidal steel mast makes reference to one of London’s architectural highlights, the spire of Hawksmoor’s Christ Church. The inte- rior timber lined walls are reminiscent of boats of ‘old’, but have been boldly coloured magenta and turquoise. Bespoke furniture has been carefully integrated, including a centrepiece bed which slides on rails to make the most of the views over London. A pulldown ladder gives access to a small library room above the main space, where one can further absorb the views across London whilst completing the log book. Each aspect has been considered and crafted to produce a one-off, stimulating space. A Room for London will be a visionary land- mark for the city in its Olympic year, presenting an opportunity, for those in London and beyond, to celebrate and connect to the capital and its cultural past, present and future. Artangel is producing a programme of writings, readings and live music webcasts created in A Room for London. The programme includes A London Address, a series of urban reflections by writers; Sounds from a Room, a sequence of live webcast performances by musicians from across the globe; and Ideas for London, a competition, in association with the Evening Standard, to discover Londoners’ most remarkable ideas for their city. This extraordinary variety of words, sounds and ideas will be featured on A Room for London’s website. The programme is part of the London 2012 Festival.